CNC machined multi tool with chain splitter. Great little tool. It is thin so fits well in most saddle bags and has most of the required Allen keys as well as the chain tool for that worst case scenario. You won't find a lighter, cheaper, or more robust tool. This has chrome vanadium bits as opposed to other cheaper tools that will just be some softer steel that will rust and not last the distance. Great tool in a compact size. Great quality, small and light..just try not to lose it! 2nd of these I've bought. Lost the other one when my Uno Seat Bag fell off unnoticed . My favourite multi tool due to slimline design and low weight. It will go in a jersey pocket without causing sagging. It's also durable and very well made. Got several of these. Compact but effective. 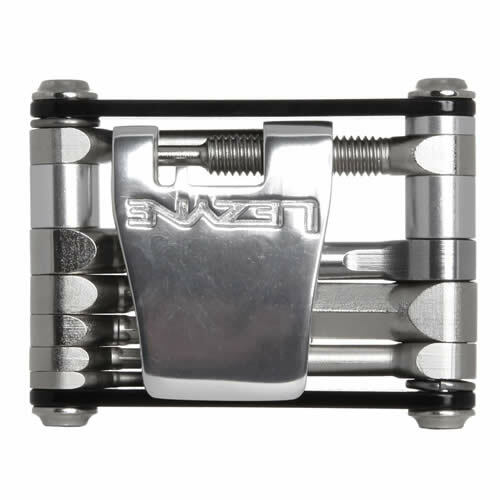 They can get a bit corroded and difficult to open if you use them in wet, muddy conditions on an mtb. Really small, very lightweight. Only slightly bigger than a box of matches and about the same weight. I bought it and as soon as my friend saw it, he ordered one too. Seems ok. I can understand how people are concerned how you cannot have enough pressure to use this tool effectively. I think it will be good in a pinch. Marketing info on packaging claims to be able to work on an 11 sped chain. This item contains enough to adjust my bikes, but It's not so easy to use depending on the parts which I want to adjust. Bloody awesome. Small, light AND sturdy. It could do with a flathead though for turning slightly damaged derailleur limit screws. Very nice product, light, small to put in the pocket and functional, there are all tools you need in the ride.